Are Regular Team Meetings Worth It? 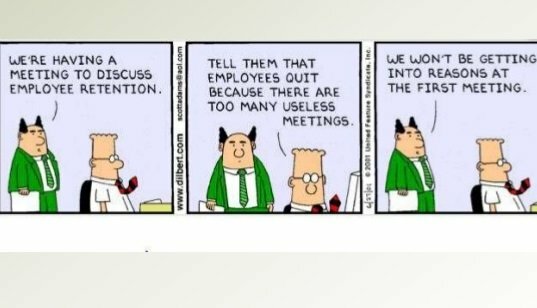 People complain about the volume of meetings they attend… a lot. Is adding a weekly or monthly team meeting worth it? If you don’t think so, I’m guessing you’ve had a bad experience with a regular team meeting or feel that you and your team are too busy to add something else to your schedules. Maybe in the past the regular team meetings you attended have been poorly planned and were not particularly meaningful. There is no doubt that bringing a team together just because you were told to, or because you haven’t done it in a while won’t be effective and will be a waste of time. For regularly scheduled team meetings to be effective, they need to be well planned. Why are we bringing the team together? What do we want to reinforce and accomplish through these meetings? What crucial updates can we share and what progress can we show? Team Meetings, when done well, build alignment within the team. As a leader, you have the opportunity to communicate and reinforce the WHY of the organization (the values and the purpose), and the WHY of your team and projects to ensure everyone understands the big picture and feels connected to it. When done well, Team Meetings build ownership amongst the team and hold the team and the individuals on the team accountable. At each meeting, discuss what top priorities are, what projects are on the plate and the timeline. That information is tracked in meeting minutes and is then followed up on at the next team meeting. No one wants to attend a meeting and be the one who doesn’t have a meaningful update on their progress. Individual team members also get insight into what everyone else is working on and can see the level of ownership and commitment amongst their colleagues. Teams where individuals feel their colleagues are committed to quality work perform better than teams who don’t. Team Meetings are an excellent opportunity for leaders to demonstrate the progress the team has made and build commitment toward bigger goals. Teams do better with more information and when they are reminded of how far they have come. The goal of the meeting is really to inspire greater effort and more engagement when the team goes back to work following the meeting. If the team works harder, has a better understanding of why they are doing what they’re doing, and know what updates they are accountable to report on at the next meeting, their chances of success are greatly increased. If you do make the commitment to incorporate a weekly or monthly team meeting into your team’s schedule, be sure to lead by example. Make that team meeting a priority for you so that your team members also make it a priority. Hold to your meeting schedule. Only cancel the meeting or move the meeting time if absolutely necessary. In a busy time or in a time with few updates, still meet, just keep the meeting shorter with very high level updates. When leaders run well-planned team meetings routinely that involve participants, communicate the WHY and expectations, develop action items and follow up on past items…You not only get results, you also build your team and a culture of ownership and commitment.